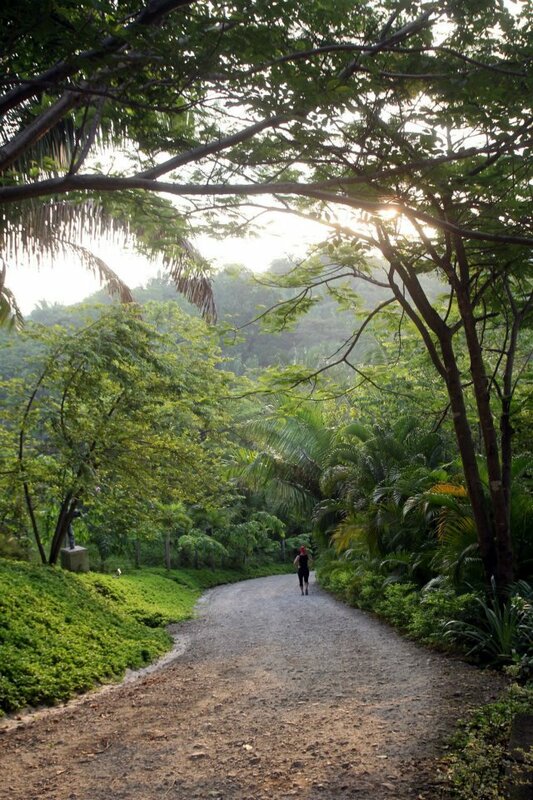 Paradise in paradise…June in 2012, I spent the month in Nosara, Costa Rica, studying, learning, running up hills (see photo), practicing yoga, and rediscovering what is wonderful, beautiful and awe-inspiring about life. 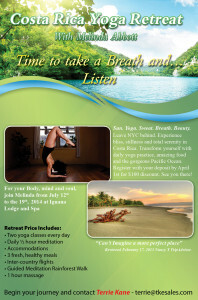 I traveled to Costa Rica to partake in a 300 hour Yoga Teacher Training with Jivamutki Yoga (www.jivamuktiyoga.com). I cannot express how transformative this endeavor was. Words could never be enough and will only serve to dilute the experience. There are a few highlights I can summarize below. 2. Actions that are selfless generally produce better outcomes than actions that are selfish. This is because with every action we are creating and projecting our world. If we create and project a world where we are kind, compassionate, selfless and thoughtful, we suffer less. We are rewarded with experiences of peace, feelings of love and a bountiful stream of blessings, prosperity and feelings of unity rather than feelings of division, manipulation or guarded self protection. This takes practice, patience and an earnest desire to change. We are often up against social norms that tell us how great it is to succeed at the expense of others, and how being nasty, spiteful, vengeful and selfish is empowering, and being kind and of service to others is weak and leaves us open to pain and hurt. This shift poses a question only you can answer: Do you feel good around people who are mean, nasty, self-serving and seeking only power, revenge and control? Or do you feel good around people who are kind, thoughtful and generous in word and deed? 3. Teaching and practicing yoga is a noble, humble and honorable pursuit. Sometimes in the competitive, high stress world of winner-take-all and survival-of-the-fittest, we forget that there is more to life than being “the best” or “the only” or “elite”…What about the space to enable peace and tranquility? How about providing relief from tension, pain, chronic agitation and worry? What about engaging not only the physical body, but the emotional, spiritual and energy body as well? 4. What we seek, I believe, is control (relative term) over the mind. We often take a circuitous route to control the mind by first attempting to control the body. We may live in a state of subtle or very obvious chaos, where whirlwinds, discomfort, dis-ease and often irrational thoughts of likes/dislikes/preferences only serve to limit us. Imagine for a moment if there were no concept such as “I am just not a morning person” or “I could never do that pose, its too hard for me” or “Yoga and I just don’t mix, I don’t have the time, and its too far away” etc etc etc…Think of all you could accomplish! We cant do it alone, usually. I was fortunate to meet a new lifelong friend, runner, yogi, professor and just beautiful person. We met almost every day for a 5:30am run in the spectacular hills and countryside of Costa Rica prior to our schedule of asana practice and lectures. Imagine if I confined myself to my perceived limitations! I didn’t even bring “running sneakers”…I made it work because I wanted it to happen. A tranquil run in the countryside alongside an inspiring and amazing person is just too incredible of an opportunity to miss! And guess what? It was never my body that said “dont run, sleep in today…sleep, so nice…” It was my mind! And I learned to discern what mental messages nudged me further towards who I want to become, and what messages kept me grounded in limitations. And I harnessed the power to choose. You can do the same. Now, currently, thanks to the amazing support and savvy of Ms. Terrie Kane, I am leading my own retreat in Costa Rica at Iguana Lodge (www.iguanalodge.com) this July! Look below…If you are interested in a week of Paradise in Paradise, then COME! Email Terrie Kane (Terrie@tkesales.com) with all questions and payment logistics. Easy. Below is my current teaching schedule. All classes are at Equinox Fitness Clubs… I hope to see you there!